If you need to get a passport fast, don’t worry – you have a number of options to obtain a passport urgently. Expedited passport service will help you get your passport fast. There are even emergency passport services if you need to get a passport in 24 hours or less, including same day passport service. Read on for all your options for rush passport service. Getting a passport by mail typically takes up to 6-8 weeks, but if you need to get your passport fast, you can request expedited passport service. With expedited service, your passport will be returned to you in 2-3 weeks. An additional government fee of $60 applies to this rush passport service, as well as to all the other fast passport services we’ll cover here. If you need to get a passport urgently, you have the option of going in person to one of the 26 US Passport Agencies located in major cities across the country. Same day passport service for emergencies is available at US Passport Agencies, as passports are made on site. Find the most convenient Passport Agency. Make an appointment by calling the National Passport Information Center at 877-487-2778. 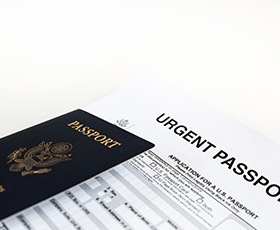 Have proof of your need for emergency passport service, such as a flight itinerary showing an imminent departure or documentation showing a life-or-death emergency overseas. Bring all the required documents for your passport service. Bring your driver’s license or other official identification, as you will need this to be allowed to enter the Passport Agency. Passport expediting companies offer a convenient way to get your passport fast. With a passport expediting company, you can get emergency passport service in as little as 24 hours. You also have the advantage of a team of passport experts who can advise you on all aspects of your application process – when you are in a rush for a passport, you don’t have time for any mistakes! These companies can provide such fast passport service because they are registered with the US State Department and are able to visit US Passport Agencies in person on your behalf. They receive expedited passport services, including same day passport services, to get your passport fast. To find a reputable passport expediting company, visit our Registered Passport Expeditors page. Most people who need to get a passport fast are in a hurry because they have an upcoming trip. But what if you don’t have travel planned? You might want to get your passport fast because you know you are going to travel, but you haven’t booked your flights yet. Or you might need a passport in a hurry because your passport is expiring, and you don’t want to be caught without a valid passport. Regional Passport Agencies will only allow you to apply in person if you have proof of urgent travel. But there are other options to get your passport fast without proof of travel! You can apply for rush service by mail without providing any travel plans. All you have to do is pay the $60 expediting fee to get your passport fast, and your passport will be processed in 2-3 weeks instead of the standard 6-8 weeks. Another option to get your passport fast is to use a registered passport expediting company. They will be able to obtain your passport quickly even if you have not purchased plane tickets.